It’s a small piece of history — one that speaks to Colwell’s phenomenal life story. It’s also, he said, a decent mandolin. 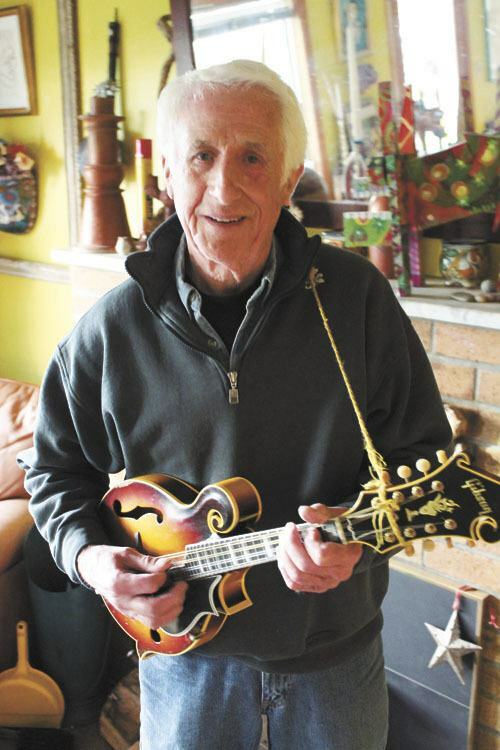 “We traveled through all kinds of terrain, and this mandolin held up beautifully. It’s a work horse,” he said. If anyone can be called a beloved Islander, Colwell, 77, can. He works full-time at Vashon High School, where he’s a para-educator, assisting students with disabilities. White-haired and genteel, he comes across as a kind uncle, always concerned about the high school students he knows, people’s children, his neighbors and friends. Rarely, it seems, does he mention himself. But his unassuming style belies a remarkable personal story — one that began more than 60 years ago, when he and his brothers got signed by Columbia Records. Paul was 16 at the time, his brother Steve, 18, and Ralph, 14 — the youngest to be signed by a major label. The boys — a fourth brother became a doctor — took to music in their home in Southern California and later, Indiana, where they’d sing “You are My Sunshine,” harmonizing easily, Paul recalled. Steve, at age 14, answered a special offer in a magazine and sold enough seeds to earn a guitar. In 1948, he suggested the brothers start a band. Paul bought a ukelele and within two weeks, the brothers, wearing matching cowboy outfits, performed at a school assembly. “Right away, we were out there,” Colwell recalled. It was an auspicious beginning to what would become a life of globe-trotting and headline-grabbing musicianship. In 1953, after winning talent shows, garnering spots on radio shows and even making regular appearances on a TV show, the brothers were invited to Caux, Switzerland, for a gathering at the headquarters of Moral Re-Armament (MRA), an international organization focused on reconciliation. Paul had just been accepted to Occidental College and his older brother Steve had been there two years when they decided to begin traveling with the MRA delegation. It was also when they hooked up with Herbie Allen, another American musical prodigy — a man with whom they became lifelong musical collaborators. Paul and his brothers traveled with MRA for the next 13 years, providing the musical component as the organization sought unity and peace in Europe, Asia and Africa. He never made it to Occidental, nor did his older brother return. Rather, they ended up writing and singing songs in 42 different languages. They sang for the King of the Maori people in New Zealand, the prime ministers of Japan, Thailand and Burma and feuding factions in a recently liberated Congo, where they spent a year. Those MRA days were significant for another reason. It was during his travels that Paul met Catalina Quinn, the daughter of actor Anthony Quinn and another member of the MRA delegation. They got married in 1967 and eventually had three children. Paul talked about those early heady days as he sat in the home he shares with his wife, a painter. The house — cottage-like, with large windows overlooking Quartermaster Harbor — seems to reflect the life that he and Cati, as he calls her, have chosen. It’s small, at once both gracious and modest, an artful home that the couple rents. Indeed, Up With People — with its hopeful message conveyed by the clean-cut Colwell brothers — initially captured a segment of America weary of the 60s. Over time, it became an organization dedicated to youth empowerment and international understanding — which is still is today. That organization’s path, too, was phenomenal: The Colwells helped to produce shows in six continents, playing for athletes in Munich after the terrorist attack in 1972, in a bullring in Madrid, in Watts, Carnegie Hall and at six Super Bowl halftimes. Colwell’s life is quieter now, for sure, he said. He and Catalina moved to Vashon a decade ago, after 27 years in Tucson, where Up With People was based. They came to Vashon in part because Cati, raised in California, missed the ocean. Some days, when it’s raining hard and they’re looking out over the bay, he’ll turn to her and ask, “Is this enough water for you?” he said with a smile. But he still cares passionately about young people and the kinds of positive experiences music can provide. Sunday’s performance, he said, is a nod in that direction. FamJam 2012, a concert featuring the Colwell Brothers and Herb Allen, will take place at 4 p.m. Sunday, at Open Space for Arts & Community. The show — a gathering of musical friends and family put together by Islander Paul Colwell, co-founder of the famed group, “Up With People,” — is a benefit for Vashon Allied Arts youth scholarships and the Interfaith Council to Prevent Homelessness’ dinner program. Colwell, an expert mandolinist, has enticed an array of talent from Vashon and beyond to join him on the stage. His singer/songwriter son, Jeb Colwell, will be there, as will his brother, Ted Colwell. Herb Allen, “Up with People” co-founder, will bring his virtuoso keyboard and xylophone playing to the mix. Drummer Gib Dammann and banjo picker Rochelle Munger complete the ensemble. The performance wouldn’t be complete without the voices of children, so Islander Marita Ericksen will direct the Vashon Island Youth Chorus in a song or two. Other featured performers include the Island band, Poultry in Motion, songwriter/vocalist Allison Shirk, The Three Amigos from Vashon High School’s Percussion Ensemble, and hip hop artist and VHS senior Peter Evans. Tickets to the concert, $12 general and $10 for children, seniors and VAA members, are on sale at Vashon Bookshop, Vashon Pharmacy, the Blue Heron and www.brownpapertickets.com.